Here is the schedule and Information for Gold Prospecting Lessons Cue WA in 2019. We have removed this form as the seminars are fully booked. What You Will Learn at the Gold Prospecting Seminars in Cue. Metal Detecting Using the Minelab 2300, 5000 and 7000. Including Field Practise. Metal Detector Coils for the 4500 and 5000 - The Best and the Coils you should use and Why. Set up and use of Geomap on your PC with Basic GPS understanding. What you do after you find your gold, cleaning, how to sell it, Dollying gold. On the first 2 days, Saturday and Sunday we will cover metal detecting, equipment, coils, settings, Tengraph, WA Geology and Geomap training. That is conducted in the airconditioned St John Ambulance training rooms at the street behind the Caravan Park in Cue. On the third day, Monday, we go bush looking for gold at a gold mining lease or tenement around the Cue Goldfields depending on availability and weather conditions. Udo, Sue and I will be walking with you and looking over your shoulders, offering support and practical training while you are metal detecting on this day, we want to make sure your techniques are the best to enable you to find gold..
We also stop on the way to discuss the local Geology and do a practical exercise on Geomap Tracking and Saving Tracks to make sure you gain practical experience in this task. This day will also give you the opportunity to check track conditions and camping spots before if you wish to spending more time in the area on a Section 40E Permit or where there is pending and vacant ground. On the Monday you provide your own Detecting equipment, food and refreshments tagalong style - Metal Detectors are available for hire on this day if you need one. On the Saturday night we will have a BBQ at Udos and your partners (and metal detecting companions if they are not doing the seminar) are welcome - you provide your own meat and drinks and we will provide the salads, condiments and so on. Meat packs will be available to purchase if you want one. The price is $730 each person for the three days. If you don't have a detector we will have 5000's with nuggetfinder coils, all the gear and a pick available for hire - Minelab 5000 will cost $50 per day to hire and SDC2300 will cost $40 per day to hire. Ongoing hire can be negotiated if you are interested in extending your prospecting holiday, but is always dependent on the availability of our limited stock of detectors. The Terms and Conditions document also includes a lot more information about the training. Please Download it and read it before you apply to attend this Seminar course. You will need a PDF reader to read the Ebook, if you cannot open the downloaded PDF file then you can download Adobe Reader by left clicking on the icon below - this will open a new page on your browser where you can download the latest version of Adobe Reader to your PC. 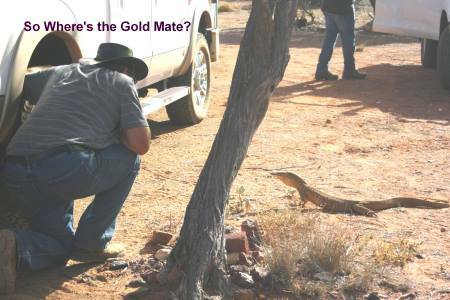 Bungarra and Allan Trying to Find Out Where the Gold is. If you have any questions please contact us using the "Contact us" Form. The gold prospecting lessons Cue will be intensive training at a central venue in the town with a full day practise on a Mining Lease or in the nearby goldfields depending on conditions at the time . Our aim will be to ensure that not only do you understand the theory of metal detecting and gold prospecting but that you can put it into practise to find your own gold and gold localities and go prospecting legally without any concern. You must have a WA miners right. This page will tell you how to obtain a WA Miners Right they are only $25 and last for life at this stage, that may change in the future though. Membership covers you for $20million public Liability insurance while legally prospecting. Most Mining Companies wont give you permission to go prospecting on their land without membership. APLA Protects your rights to go metal detecting and prospecting. Regular meetings and training at 5 branches across WA. Comprehensive Newsletter and information provided to members. Cheap membership at only $110 for the year or $80 for pensioners. You can join here Amalgamated Prospectors and Leasholders (APLA) website. Don't leave it until the last minute so you have your membership card when you do the seminar. - Morning and Afternoon teas, BBQ lunch, cool drinks, bottled water. - Access to land for metal detecting on the third day of the course. - Geomap software on a memory stick. This includes all the Geological and Topographical maps that need to be used with Geomap. This will be setup on your Windows PC at the Seminar and you will be able to use it to setup on your home PC. - A hard copy and digital Manual covering the seminar contents. - Access to the Geomap Online Training Membership website. - Directions, with maps and coordinates for your own prospecting activity after the course - note; this will always depend on availability of land in Tengraph at the time. Here is a page with information about Accommodation in Cue WA. It lists the various options and prices for your accommodation needs. Note the prices and conditions change from time to time with these establishments so please contact them to make your own booking arrangements and to check prices. Hire of metal detectors is not included but they will be available to hire if you require one at $50 per day for a Minelab 5000 machine. Note that the Metal Detecting component of the Seminar focusses on metal detecting techniques in general and Minelab GPX5000 detectors, SDC2300 and Minelab GPZ7000 detectors in particular. The allocation of a place in the training courses will be based on a first come first served basis. An email will be sent when you are accepted into the course with details of how to pay the deposit and the basic terms and conditions of the course. Return to Gold Prospecting home Page from Gold Prospecting Lessons Cue page.